Most cities have a good reason for being located where they are. The major Palestinian cities of the WestBank are excellent regional examples of rational city location. 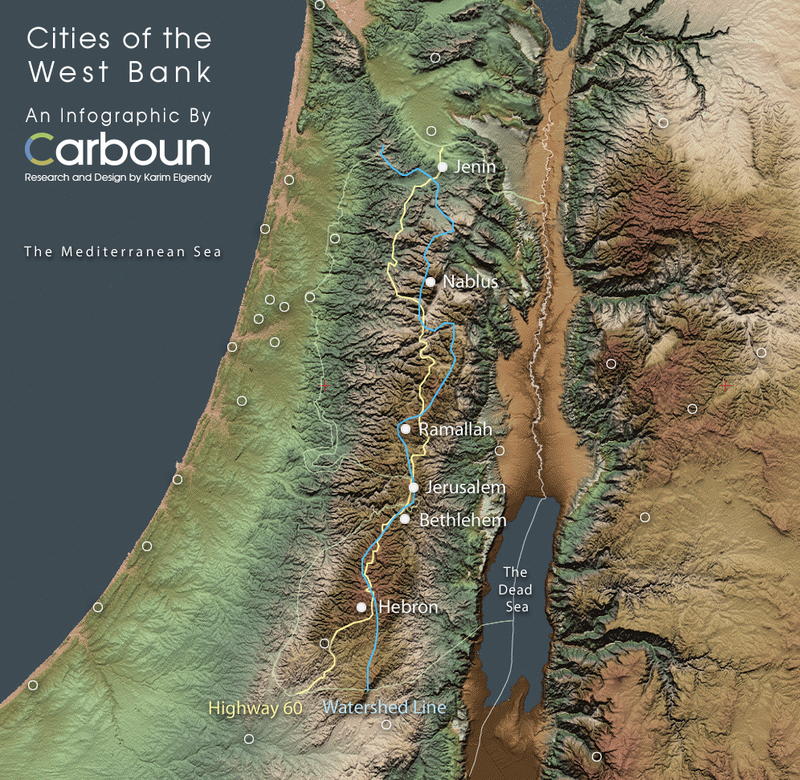 The old cities of Jerusalem, Hebron, Bethlehem, Ramallah, Jenin, and Nablus are all located on the flat ridges of the West Bank mountain range, benefiting from mild climate and significant rainfall – unlike locations only 15 miles to the east such as the oasis city of Jericho. In addition, the six cities are almost perfectly stringed along the central watershed line separating the mountain range’s eastern and western slopes, which flow into the jordan river basin and the mediterranean sea respectively, thus protecting the six cities from flood events while freeing up valley land for economic activities such as agriculture. Furthermore, the ridge locations provided an opportunity for a north-south ridge road connecting these cities. The historic route which extends further to the north to Afula and south to Dhahiriya has historically played a major role in encouraging trade between those cities. The historic ridge road is reported to have been traveled by Abraham (Ibrahim), Yitzhak (Ishaq), and Yaakov (Yaqub), and roughly followed by the modern Highway 60 which is also partially aligned with the watershed line. The maps used within the infographic do not imply an expression of any opinion whatsoever on the part of the Carboun initiative concerning the legal status of any country, territory, city or area or of its authorities, or concerning the delimitation of its frontiers or boundaries. Copyrights for all infographics are reserved for Carboun. No republishing or reproduction of this infographic or part thereof is allowed in digital, print, or other formats without prior written consent from Carboun. To discuss this infographic, please join Carboun’s discussion group on Linkedin. For news and updates on sustainability from around the region, follow Carboun’s Twitter feed.